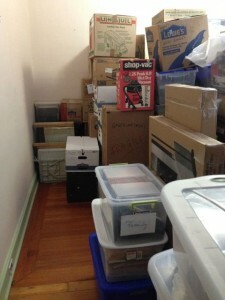 We moved Joe and Marg boxes from the Box Room to basement shelving today. These papers, books, and letters from their lives were boxed up at my family home prior to their November move to my home. For me, the words of their lives is what is hardest to let go, much harder than their clothing. I’ve placed two plastic skulls on these shelves to remind myself that they are dead, and that I should deal sooner rather than later with these boxes, so ideally, before my death, the sweet reduction of their memories is crafted by me, and not my spouse, or a careless clean-up crew. The moving of these boxes makes room in the Box Room for us to move around and make sense of the remaining estate boxes. Notice the clean left wall and now, a walk-way into the room – this is where the Joe and Marg boxes were staying for the past three months. 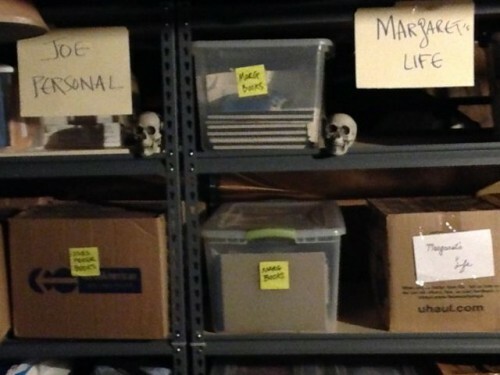 Since “Joe’s Life” and “Marg’s Life” are heavy emotional categories for me to deal with, I’ve decided to bury them with my own life trauma boxes in the basement for the time-being; may they rest in peace. In the future, when my grief-process is less raw, and estate-management priorities are further-along, I will make a project of sorting through this material to make a meaningful memorial of some kind. The moving of these heavy book boxes today was physically burdensome for me and my helper, Edith. We stopped our organizing session early today because of our fatigue; after all, we’re not 20-something men with a lot of testosterone. I’m grateful that the heavy-lifting of the estate’s material-goods is now located at my home instead of out-of-state; however, the heavy-lifting is still heavy, like the weight of a crucifix carried miles and miles with my back breaking and my bare feet cutting on sharp stones. Thank God, no one is whipping my bare skin and mocking me, with a crowd cheering-on.